Contemporary images of military life abound, but the advent of photography has provided a really accurate record. Regardless the photographer's tendency to sometimes stage scenes for dramatic effect, the uniforms and equipment were real thing. The intention of this page is to periodically present images containing details of British & Commonwealth bayonets in use or as worn. The images on view here can be enlarged by a simple click of your mouse. Please download them for your own reference. If you have similar images that you'd care to share, can I encourage you to send me high resolution scans? Minimum resolution of 300dpi please. I'll be happy to post them along with a source credit and any comments you'd like to provide. 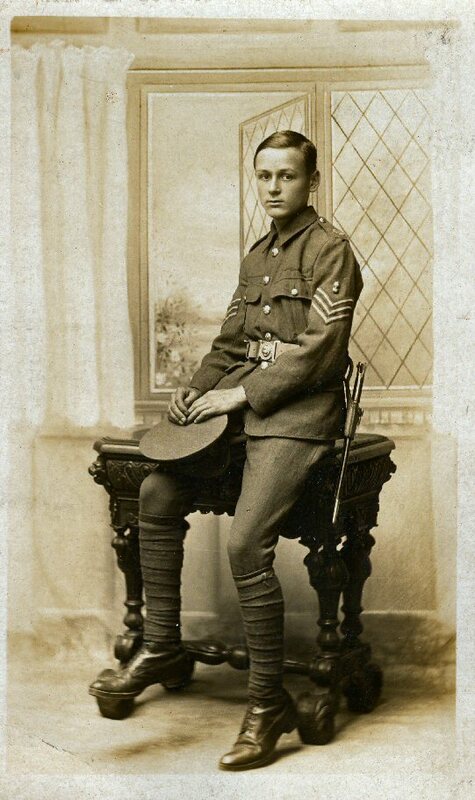 A post card photograph of a very young Sargent of the Royal Fusiliers. General Service buff leather frog and P1888 bayonet. 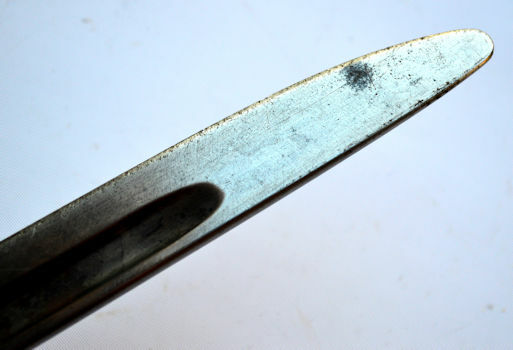 Detail enlargement of bayonet and frog. Full plate photograph taken in the Klondike 26 July 1900. The Yukon Field Force (1898-1900), composed of 203 officers and men drawn from all 3 branches (cavalry, artillery and infantry) of the Permanent Force of the Canadian Militia. It was sent to the Yukon, to be based at Ft Selkirk with a detachment at Dawson, as a symbol of Canadian sovereignty and as a support for the civil power in maintaining law and order in the territory during the Klondike gold rush. 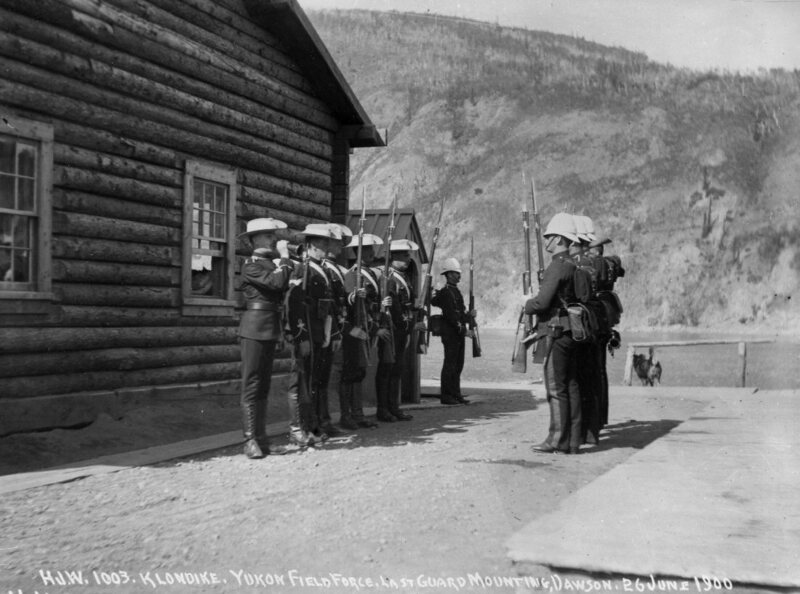 Half the force was withdrawn in Sept 1899 and the remainder, restyled the Yukon Garrison, left a year later. The image here shows the final guard mounting at Dawson. 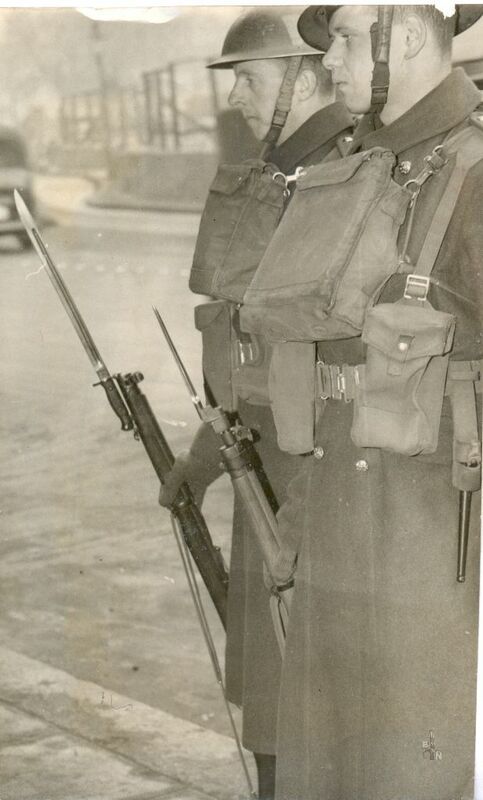 Armed with Long Lee Enfield rifles, the troops were equiped with P1888 Mk1 (second pattern) bayonets, and Oliver pattern webbing, as evidenced by the frog shown in the detail enlargement. 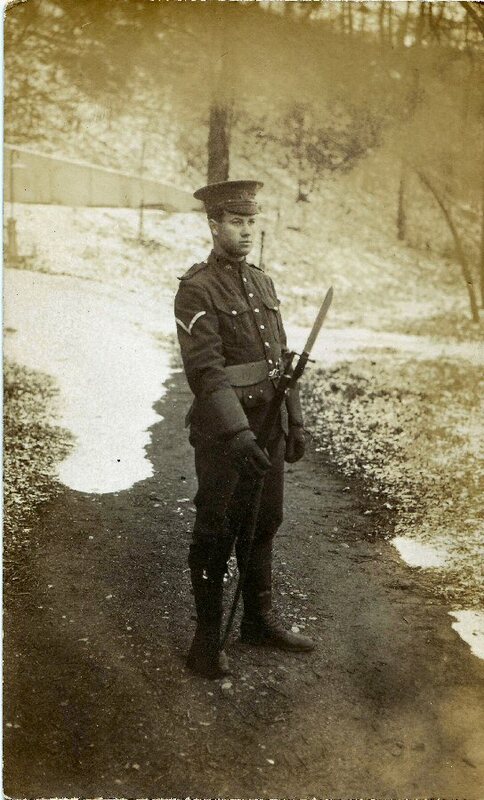 A post card photograph of a Lance Corporal with the 19th (Central Ontario) Canadian Battalion, CEF. Judging from the snow on the ground, probably taken in Canada before embarkation to Europe. 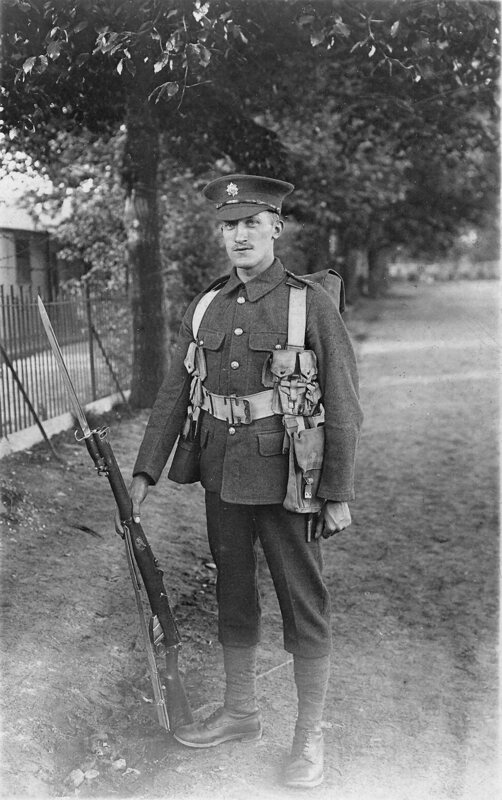 He is armed with a Mark II Ross rifle, mounting a first pattern Ross bayonet. Thanks to fellow collector David Petch for sharing this image. 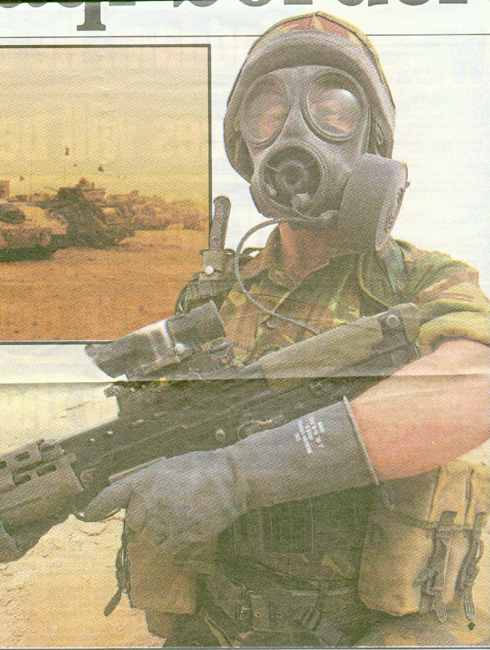 This image was published in the Daily Mail British newspaper on 3rd March 2003, the early days of the second Gulf War. It presents a British infantryman in full kit, armed with his SA80 rifle. What puzzles me is why he carries a long obsolete L1 series bayonet. Not only wont it fit the rifle, but it is not the handiest combat knife either. Any thoughts on this would be welcomed. 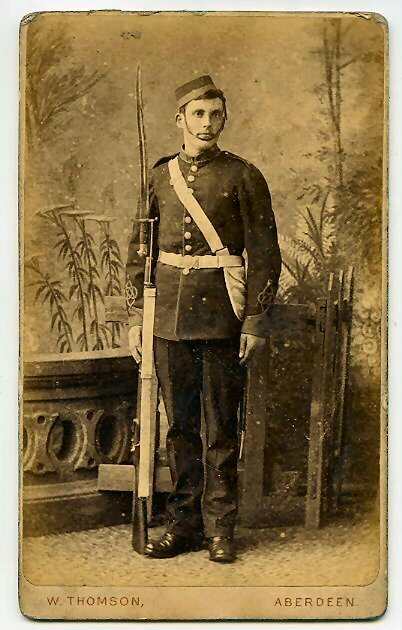 Studio portrait captured at Bodmin, Cornwall in the early 1880s of an infantry private, sporting his Martini Henry rifle, complete with P1876 socket bayonet. I suspect a studio prop, as he does not appear to be wearing the frog with scabbard. 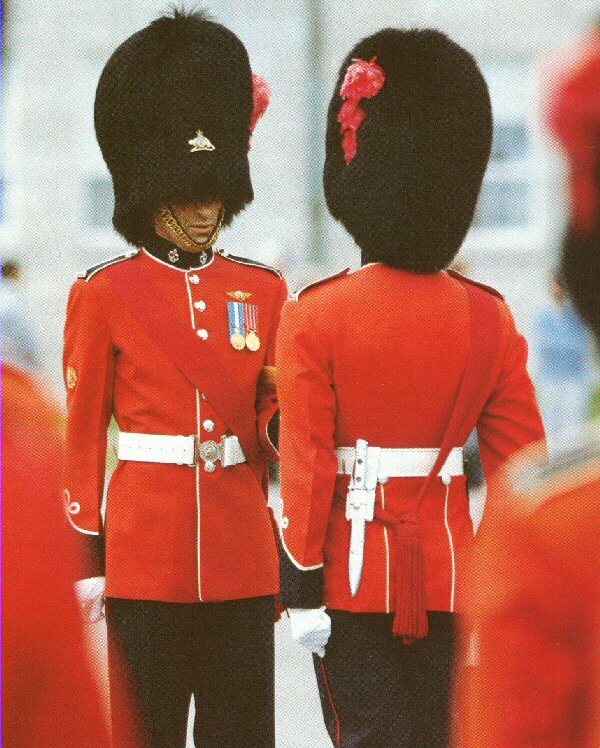 Am image culled from a car rental advertisement in 1986, showing members of LES ROYAL 22E REGIMENT (the vandoos) on parade on Parliament Hill in Ottawa. The bayonet is a Canadian C1, chrome plated overall and carried in a rather tacky white PVC belt frog. The waist belt was also white PVC at that time. 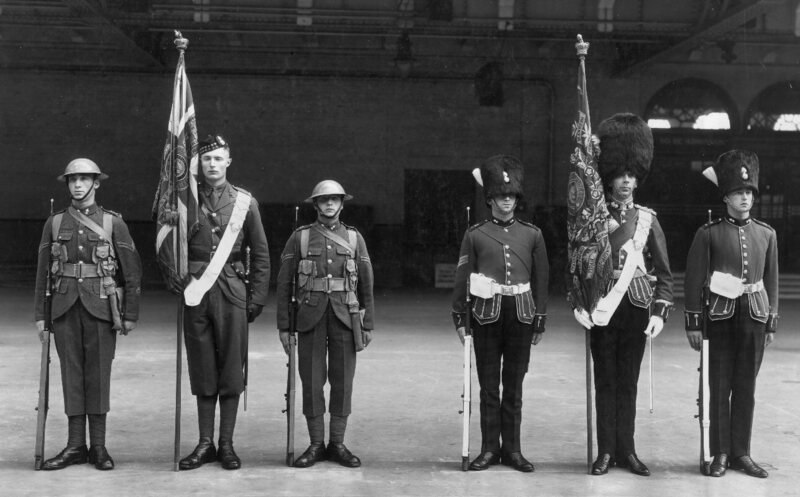 Another formal photograph taken during the inter-war years, this one of a colour party of the Royal Scots. 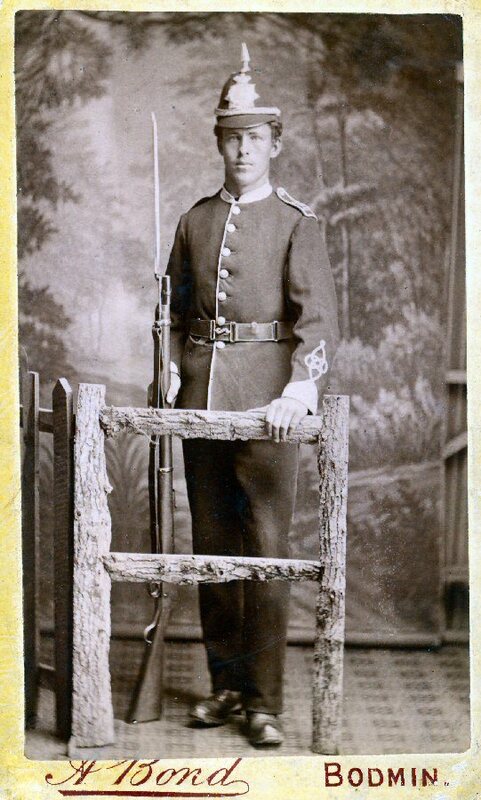 Armed with SMLE rifles and No1 Mk1 sword bayonets, the colours are again protected from bayonet points sheathed in protector sleeves with ball tips, and a Sergeant sporting a most impressively intimidating moustache. 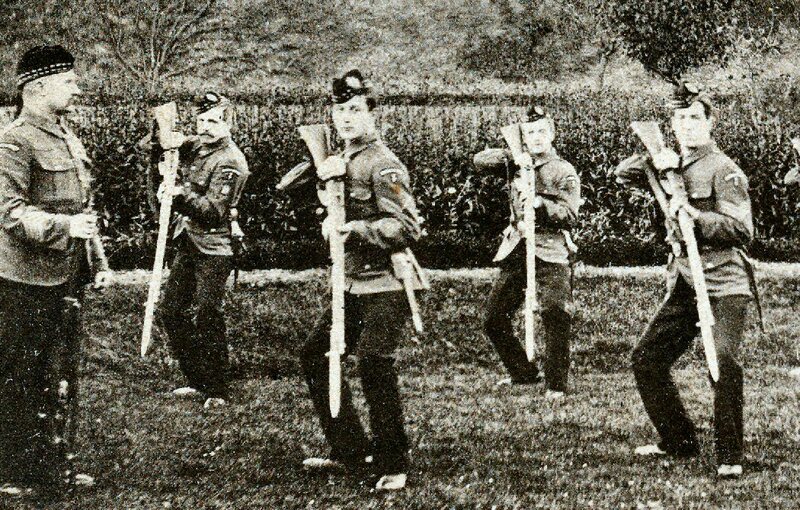 A third photo image taken during the inter-war years, the colour party of the Welsh Regiment. 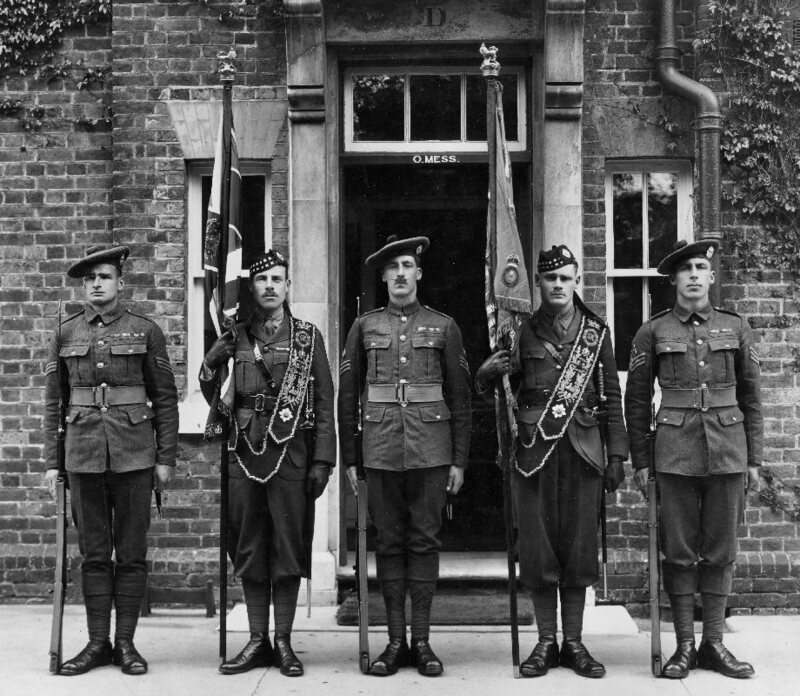 Armed with SMLE rifles and No1 Mk1 sword bayonets, these gallant men might possibly be considered disadvantaged cousins to their Scottish brethren, as their bayonet points are protected by corks. Contributed by the Officers Mess? The real Dad's Army. 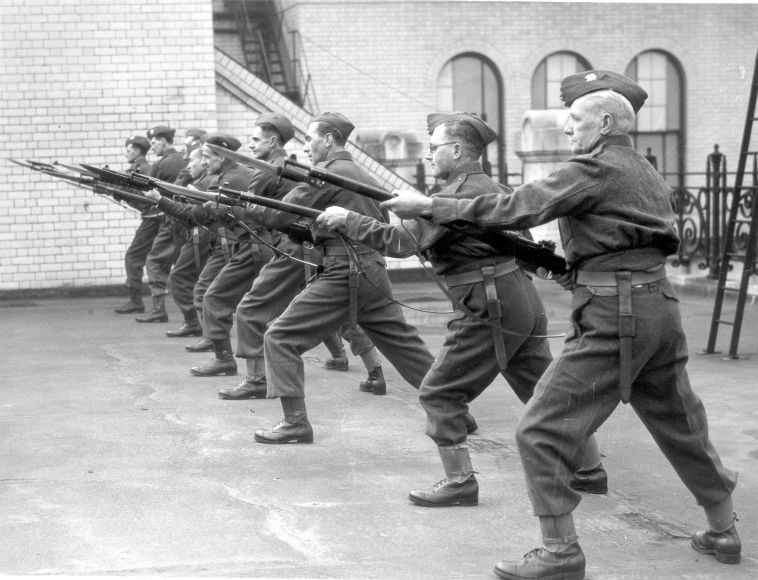 A great photograph of a WWII British Home Guard unit at practice with their Ross rifles and sharpened MkII bayonets. Thanks to fellow collector Michael Curren for sharing this image. 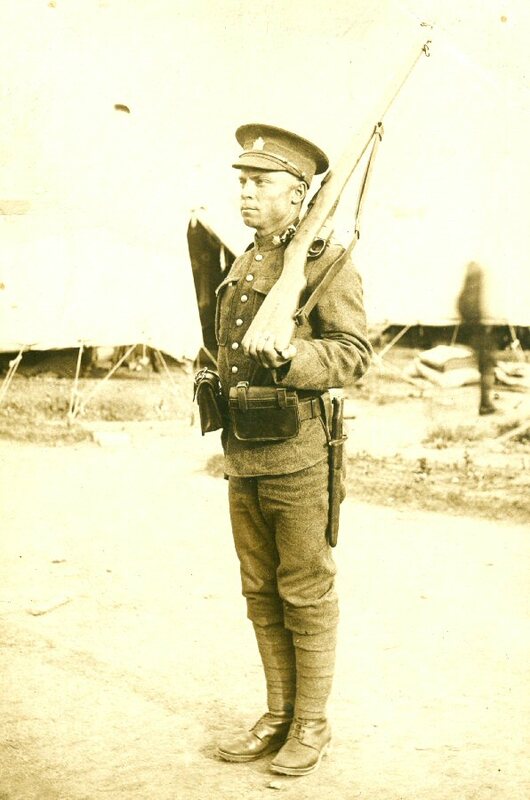 A WWI photograph of a French Canadian soldier from the 64th (Chateauguay & Beauharnois) Infantry Regiment, armed with Ross rifle and bayonet. The 64th. was raised in 1901 and eventually disbanded in 1921. While it is difficult to see much detail of the bayonet, the leather scabbard with integral frog are clearly visible attached to the Oliver Pattern belt with its distinctive snake buckle. Oliver Pattern webbing was first approved for Canadian use in 1898 and remained in use during WWI until replaced with British-issue webbing. 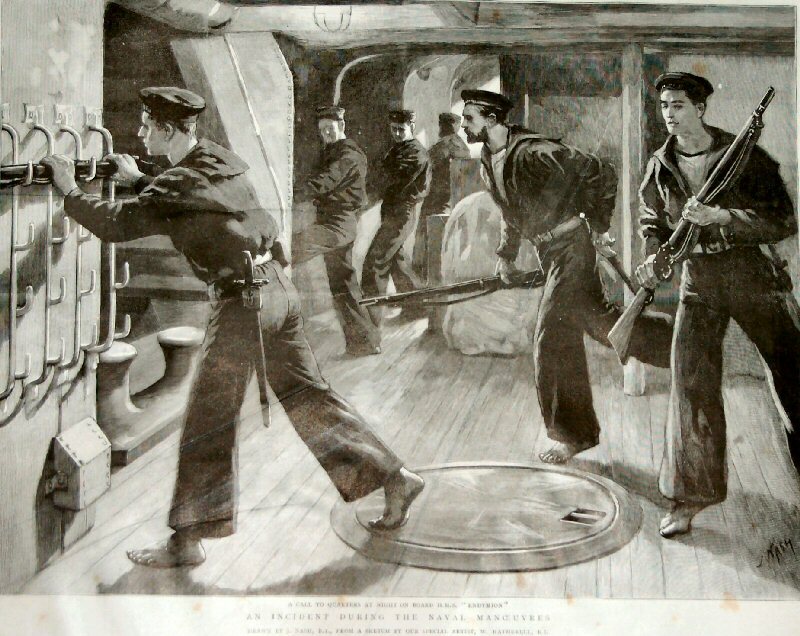 An image from The Graphic newspaper dated 17 August 1895, captioned "An incident during the Naval manouver". The illustration was from a sketch taken on board HMS Endymion, an Edgar Class cruiser. 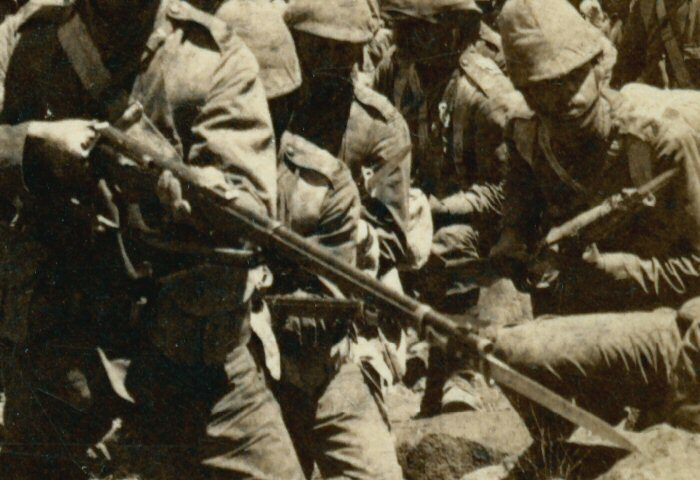 Launched 1891, the Endymoin took part in supressing the Boxer Rebellion in China, served in the Great War in the Gallipoli Campaign and was broken up in 1920. 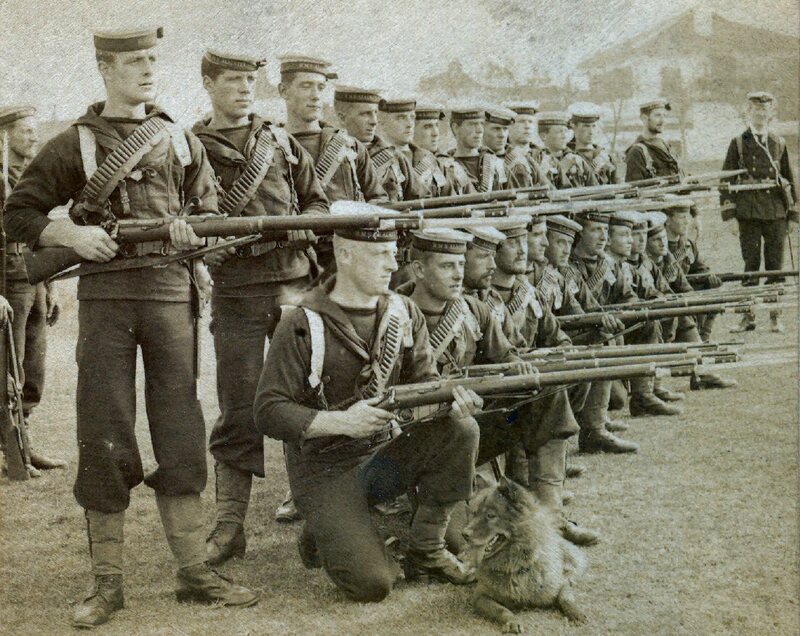 Note the sailors bare feet, the slings on the Martini Henry rifles, and the P1887 MH sword bayonets. 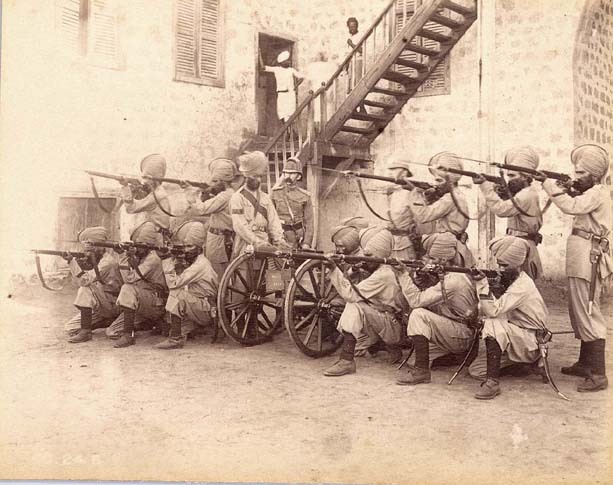 Another image of MH P1887 sword bayonets in use by a detachment of native troops in India. 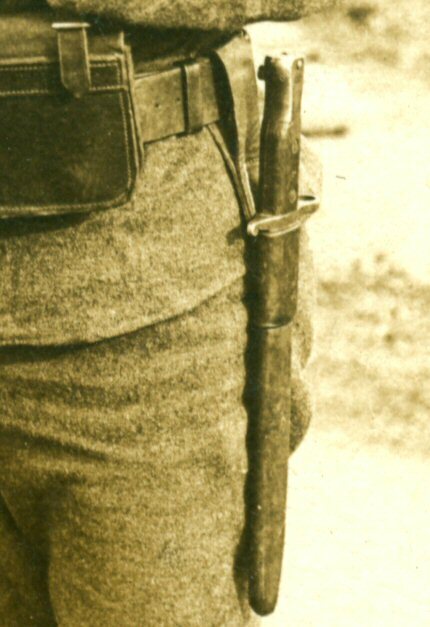 Note the bend in the scabbards, a common problem until the introduction of the shorter P1888 bayonet. Aldershot, England in August 1916. 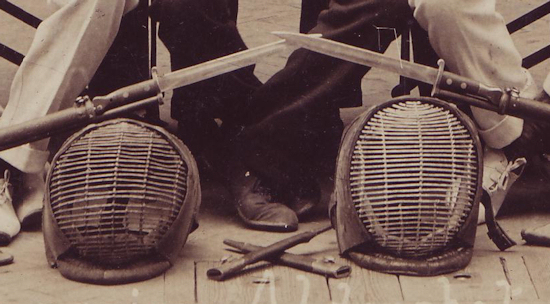 This fine looking bayonet fencing team cared not whether they used P1888 MkI or MkII bayonets. 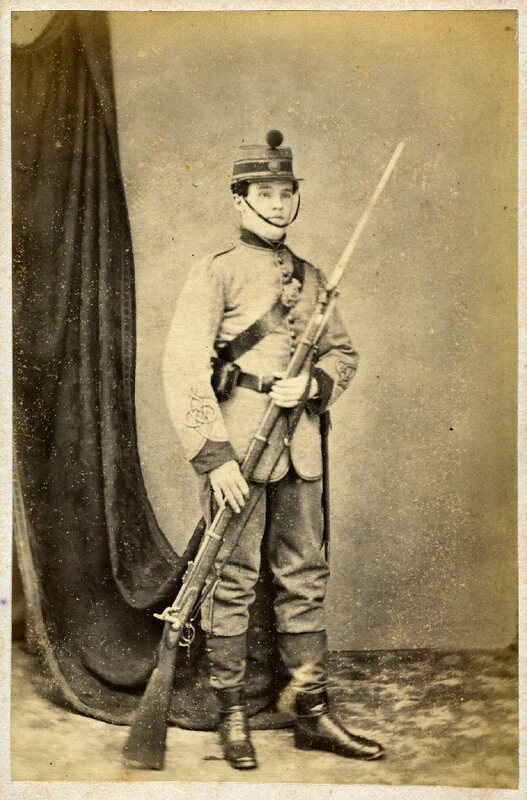 A Volunteer Rifleman c1860 armed with his Enfield rifled musket, and P1853 socket bayonet. The Imperial Yeomanry was a British volunteer mounted infantry regiment officially created on 24 December 1899 largly to make up a serious shortfall of troops for the Second Boer War. It was disbanded in 1908. 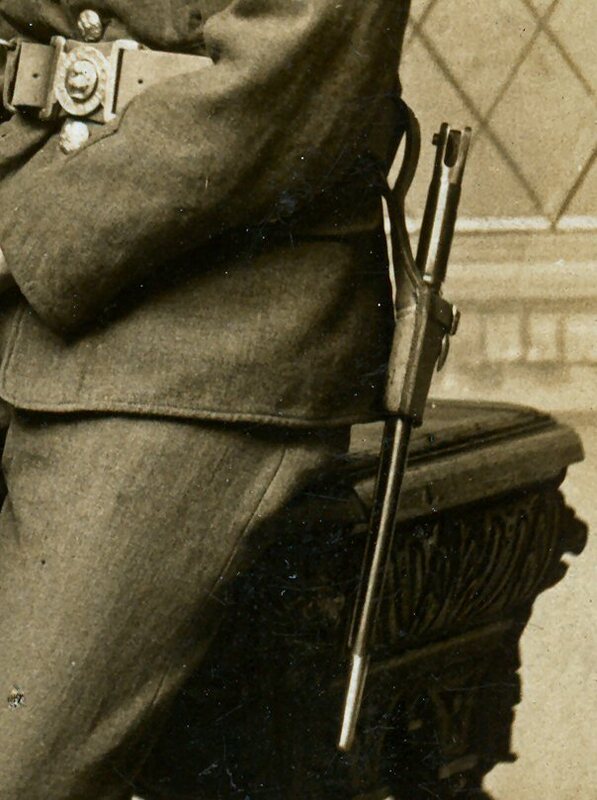 This trooper wears a P1888 MkII (second type) bayonet for his Metford rifle. 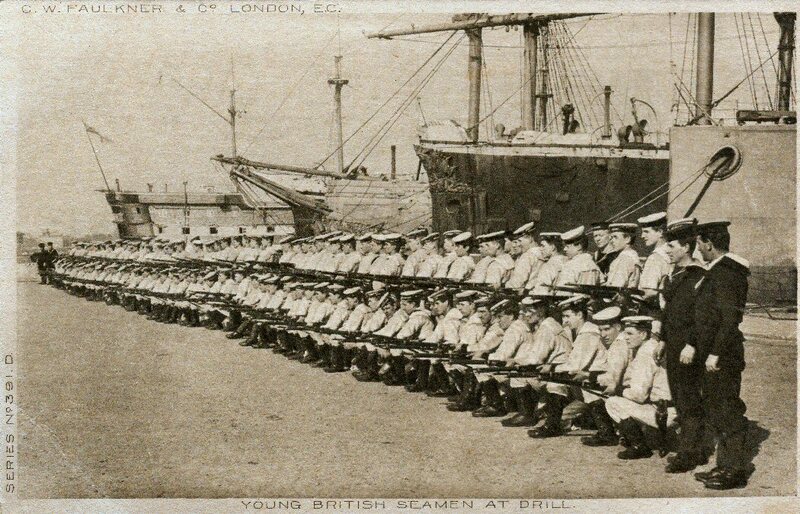 A sterio-view photo of Bluejackets from the HMS Alacrity. The card is titled British Blue-jackets lined up for a bayonet charge. Chinese war, China. Clearly a posed photograph, nevertheless an interesting image from the Boxer Rebellion. 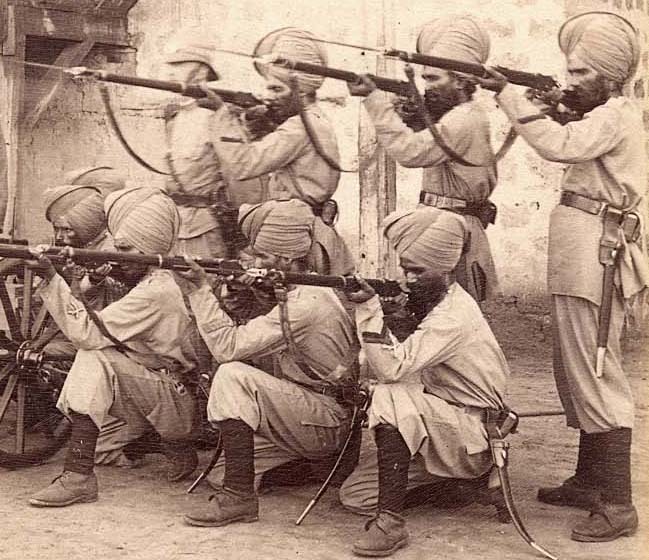 These stout hearted matelots are armed with Long Lee Enfield rifles and P1888 bayonets. The inevitable dog makes its way into the shot (see the Yukon Field Force above). 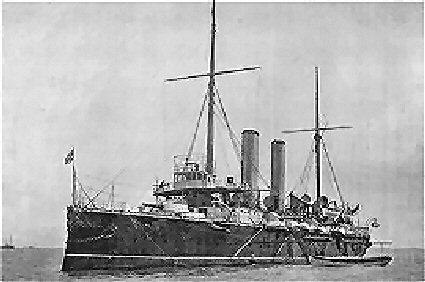 HMS Alacrity (1885), a tidy looking sloop, was a Surprise-class cruiser stationed in China at the time of the Boxer Rebellion. The ship took part in bombarding the Chinese at Taku Forts in support of the ship's commander Christopher Craddock's international naval brigade. Lieutenant "Eric" Charrington of the Alacrity received a Distinguished Service Order, and was part of the naval brigade landed from the crew of the Alacrity. Whilst the situation at Peking was becoming critical other towns in Chi-li province were a cause for concern, the Chinese section of Tien-tsin had been taken by the Boxers and the Legations their were under threat, as were the railway towns of Tong-shan, Pei-tai-ho and Shan-hai-kuan. It was learnt by Rear-Admiral Bruce that Chinese troops were heading to Tang-ku and the Taku forts, a council of international naval commanders was called on 14th June and again on the 16th June, and a decision was made to occupy the Taku forts, the British Commander C. Cradock of H.M.S. Alacrity took ashore a landing party made up from all of the nations present 321 British, 244 Japanese, 159 Russians, 133 Germans, 25 Italians and 22 Austrians, some 904 officers (35) and men (869). They advanced at night with half of the British, Japanese, Germans and Italians in the front line, with the remaining British, Russians and Austrians bringing up the rear. The ships bombarded the forts from the Pei-ho, but little damage was done in the dark. At dawn Cradock got his troops under cover and the forts were again bombarded by the ships from the river and by 4.30 am the guns of the fort were silenced. The attack on the North-West Fort was resumed; the final charge was sounded upon which the Japanese raced the British for the West Gate the two nations scaling the defences together. Commander Hattori, of the Japanese Navy, was one of the first up the parapet and upon turning to assist Commander Cradock was shot dead, the gate of the inner fort was soon forced open and this attack completed. Somewhere in the Balkans. 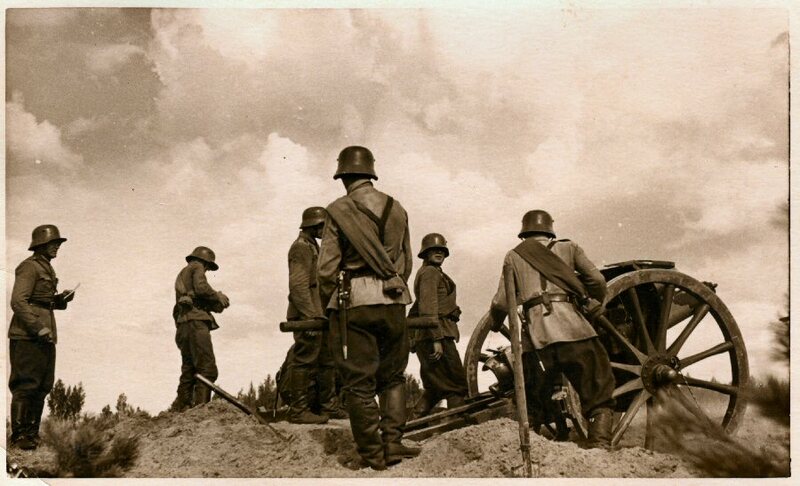 A photograph of an artillery battery at practice, possibly Latvia. Taken in the 1920s, and during a period when Balkan countries would accept almost anything to arm themselves. Fully clothed in German uniforms, yet these troops carry British P1888 Mk1 (second type) bayonets, suspended in British P1914 leather frogs. Conditions in Great Britain were a far cry from the those in South Africa during the Boer War, where troops armed with the same weapons faced a harsh climate, tenacious enemy, and rough terrain. This photo was actually posed for the camera, but nevertheless conveys some idea of the environment in which the campaign was fought. 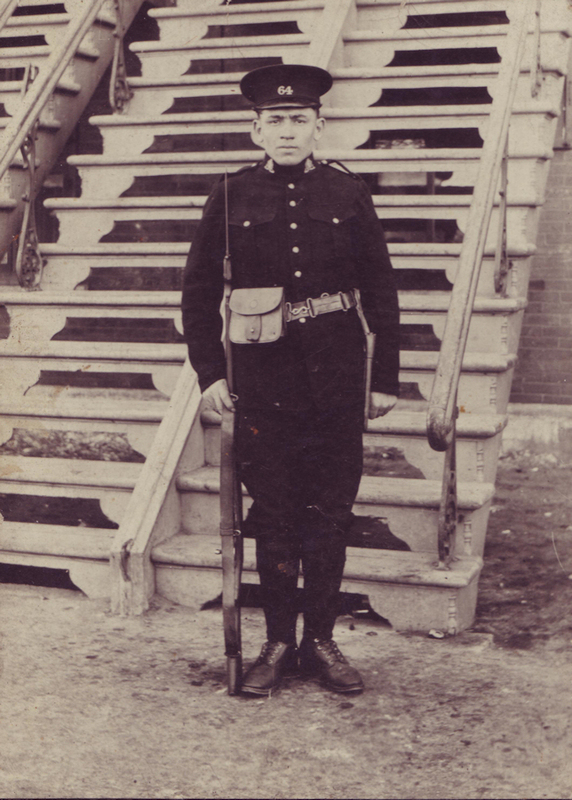 A further Great War image of a young private with the CEF, taken somewhere in Canada before posting to England. 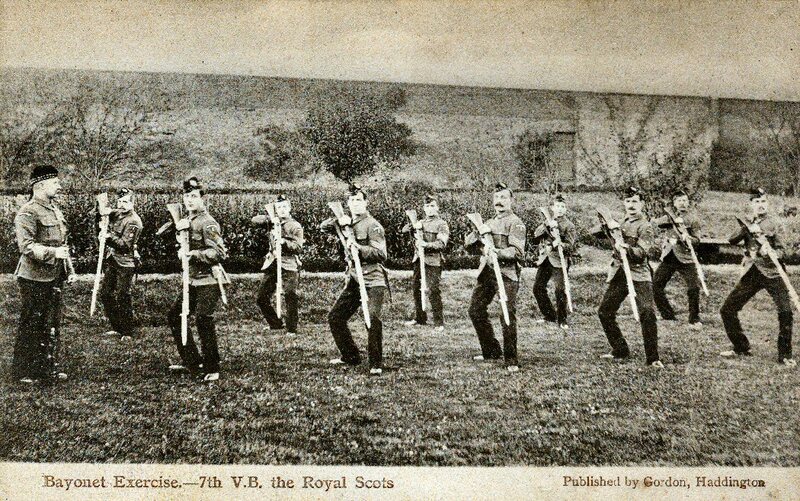 Armed with a Ross rifle and a second pattern Ross bayonet. Effective use of the rifle in the trenches quickly proved problematic, and a full scale switch was made to the SMLE and P1907 bayonet. 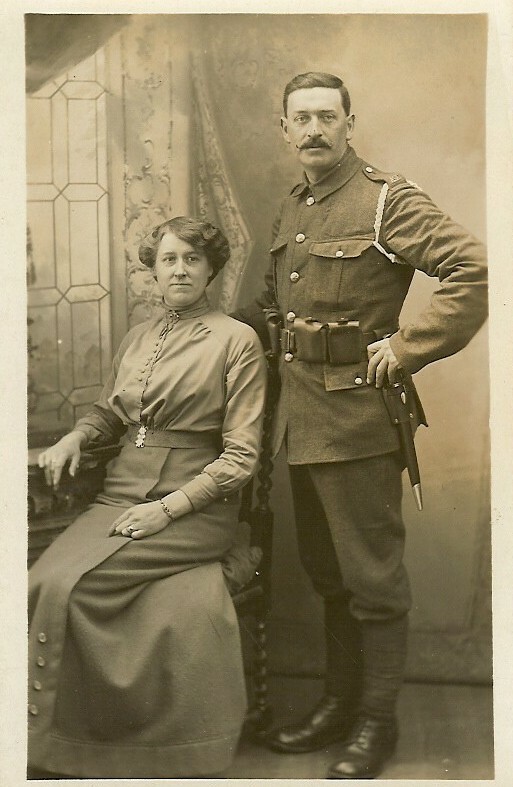 A Great War studio portrait of a British private and his wife. 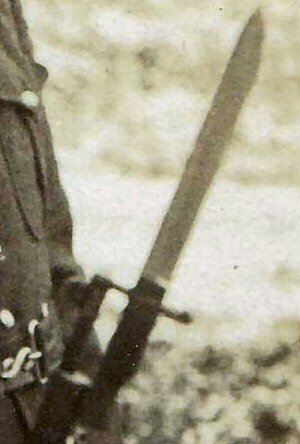 The bayonet worn appears to be a P1903, thus an early War photograph. SMLE rifles fixed with P1903 bayonets. An early Great War snapshot of British recruits. A P1853 Enfield rifled musket with socket bayonet attached. 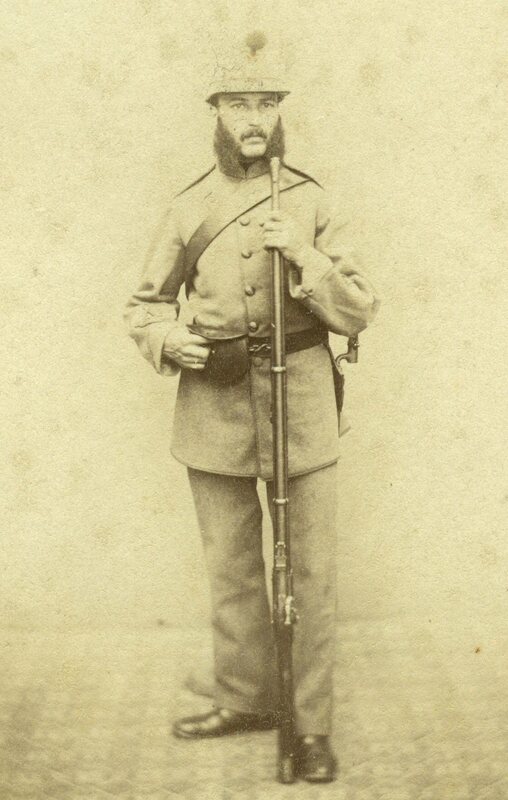 The Rifle Volunteer had his studio portrait taken in Euston (London), location of the Drill Hall for the Artist's Rifles. Unfortunately the image is not sufficiently clear to identify his badge. 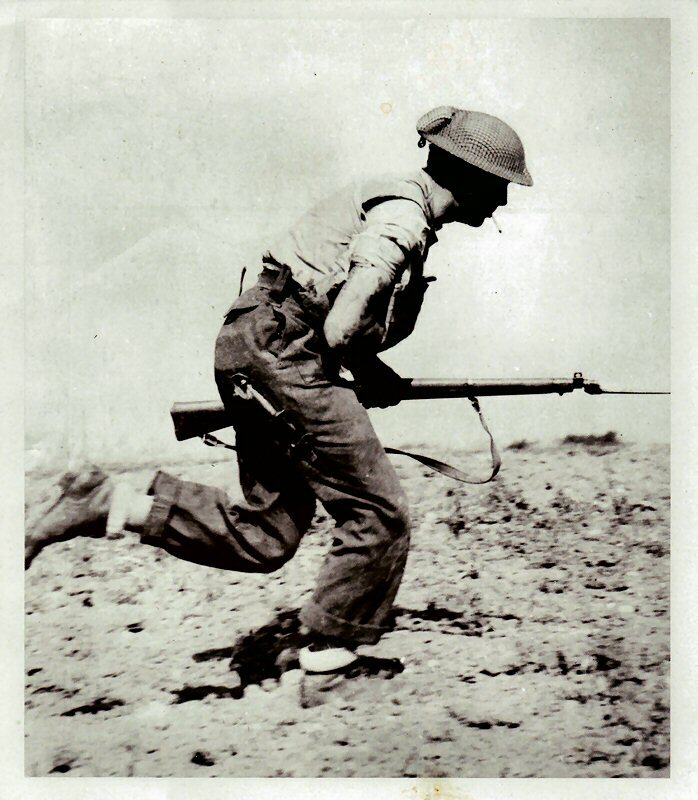 A Canadian infantryman in WWII France dashes for cover. This 1944 press photo shows a wounded soldier making for cover, carrying his No. 4 rifle with No. 4 MkIII spike bayonet mounted. Note the sheathed SF fighting knife sewn to his trouser leg. In 1951 the British Army trialed a new rifle, the EM2. With a 'bullpup' design taking .280" round, it was an inovative design that was to fail in the face of NATO pressure to standardize ammunition to a common 7.62mm. 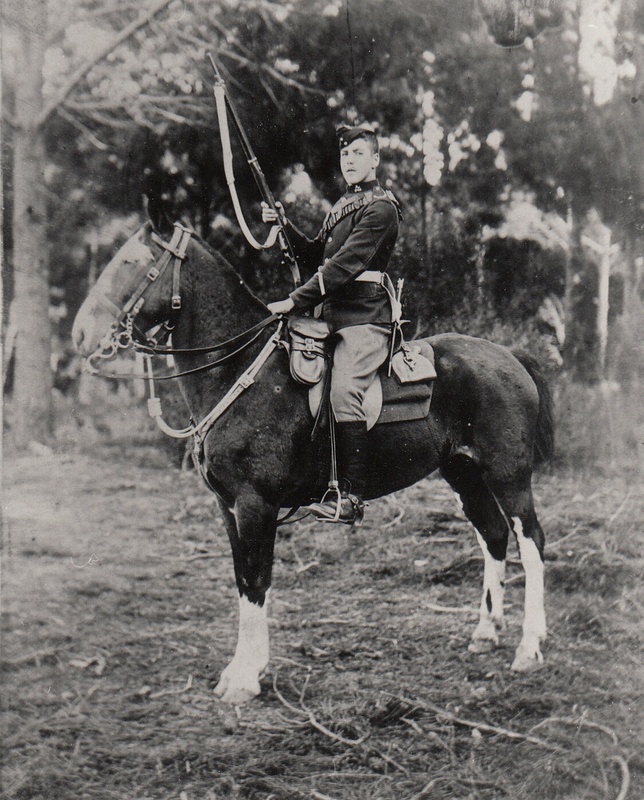 The trial rifles were fitted with the No. 7 knife bayonet, modified by simply fitting a new crossguard with reduced size muzzle ring. The press photo here shows the EM2 with bayonet in comparison with the then current No. 4 rifle and spike bayonet. The P1853 Enfield rifled musket was gradually issued throughout the British Army during and following the Cimean War. 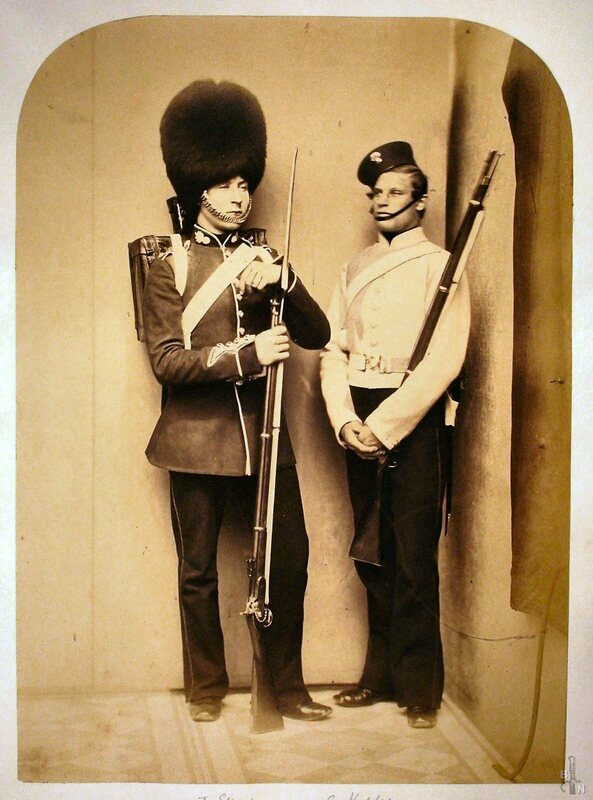 This studio portrait of Grenadier Guardsmen, taken about 1870, shows each armed with the P1853 socket bayonet. 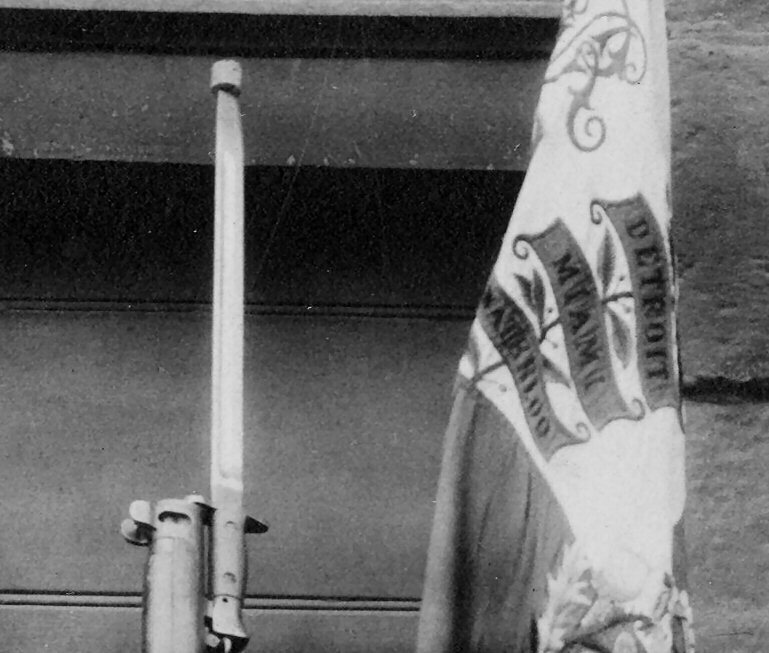 The Snider rifle was replaced by the Martini Henry Rifle in the British Army during the 1870s. 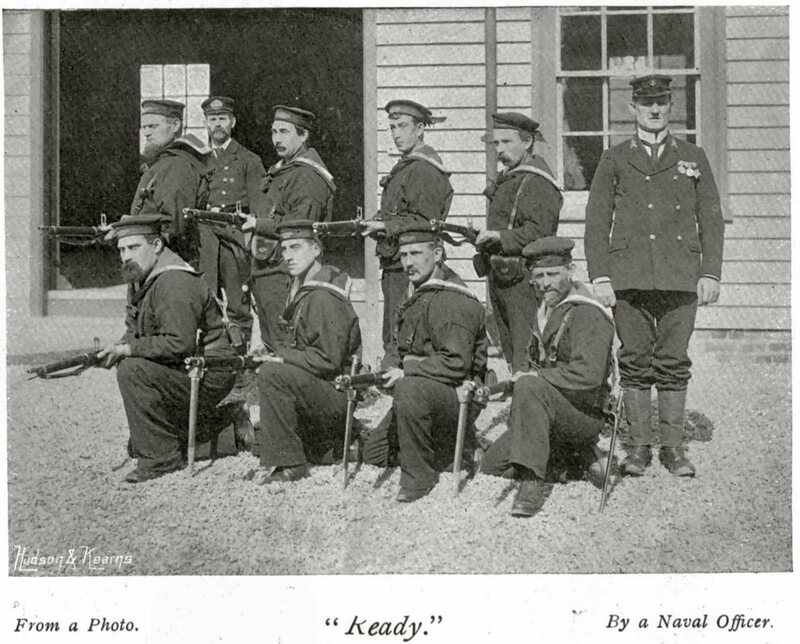 The Royal Navy, with a lower priority rating than that of their Army comrades, were always at the tail end of new small arms deliveries. Nontheless, training and use of small arms was all part of a matelots duties. 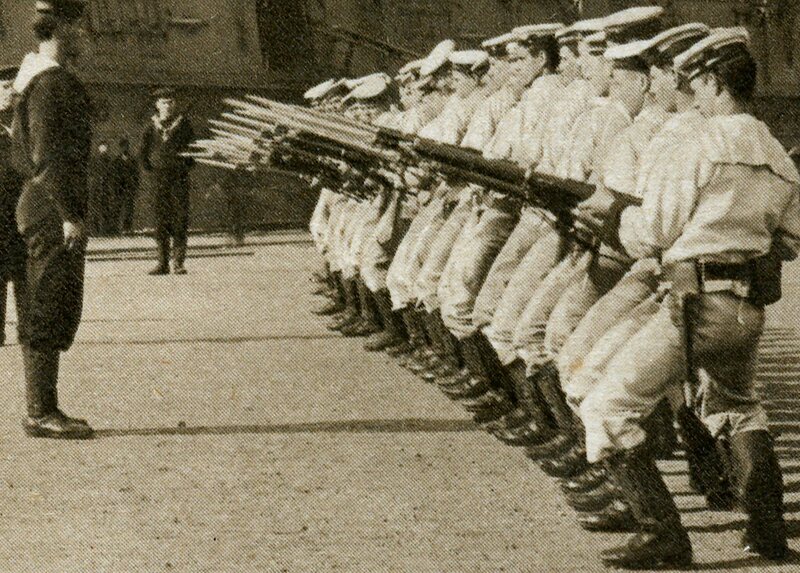 As these publicity images taken for a contemporary magazine attest, sailors were ready to use their Martini Henry rifles and P1887 sword bayonets. 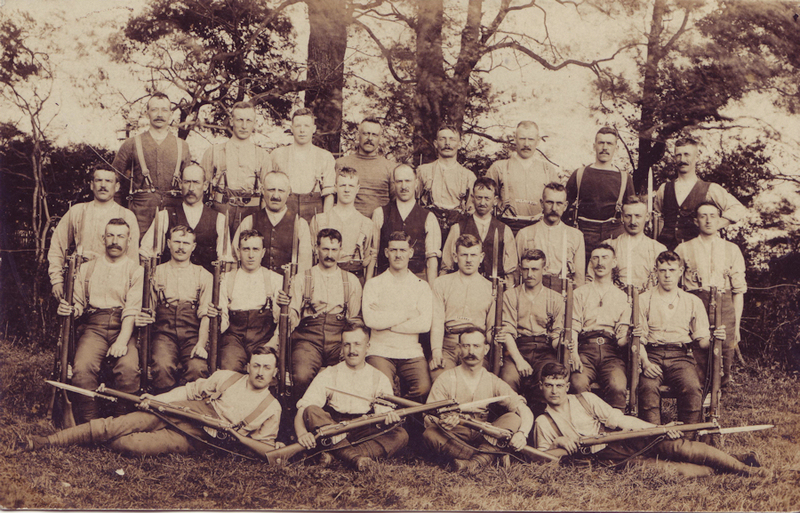 The King's Liverpool Regiment was heavily engaged in the Second Boer War, just prior to which a Company of mounted infantry was formed and underwent intensive training in Ladysmith. 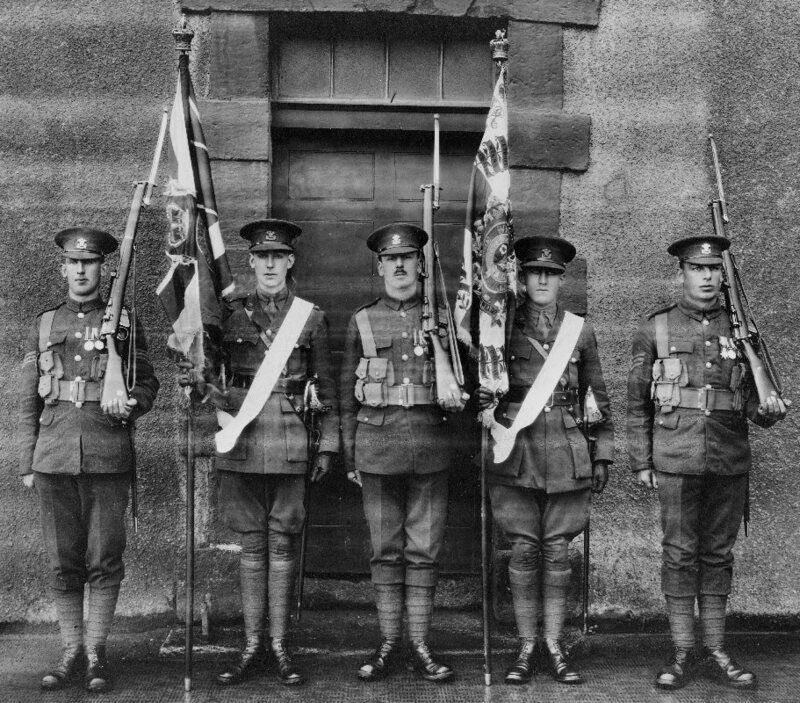 The King's were deployed thoughout the siege of Ladysmith, a number of members earning the Victoria Cross. 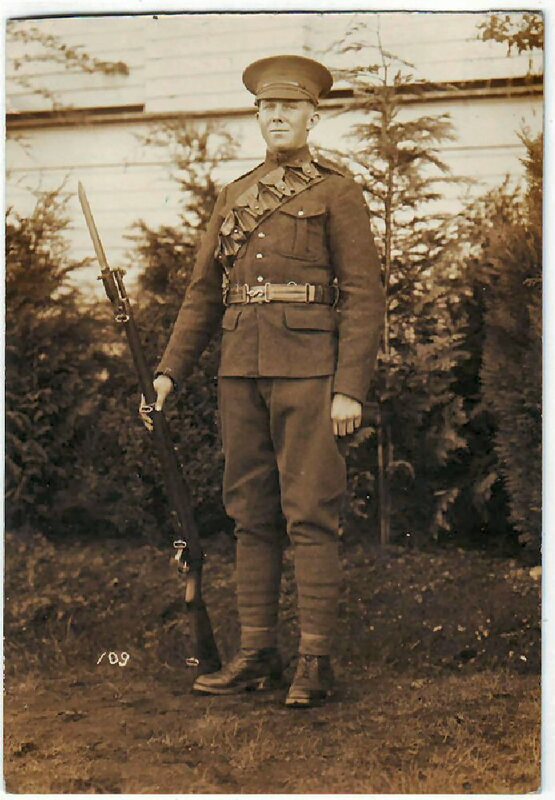 This trooper on a magnificent mount is armed with his Long Lee Enfield rifle and P1888 bayonet. Whether a regular or militiaman is hard to ascertain. 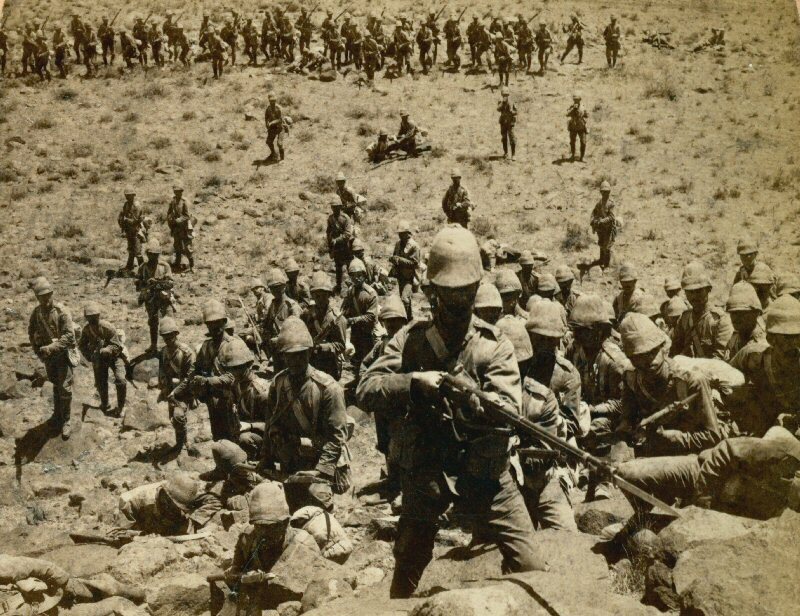 The Boer War provided the first opportunity for the regiment's volunteer battalions to serve overseas with regular forces. Thanks to fellow collector Joe Cruise for sharing this image. 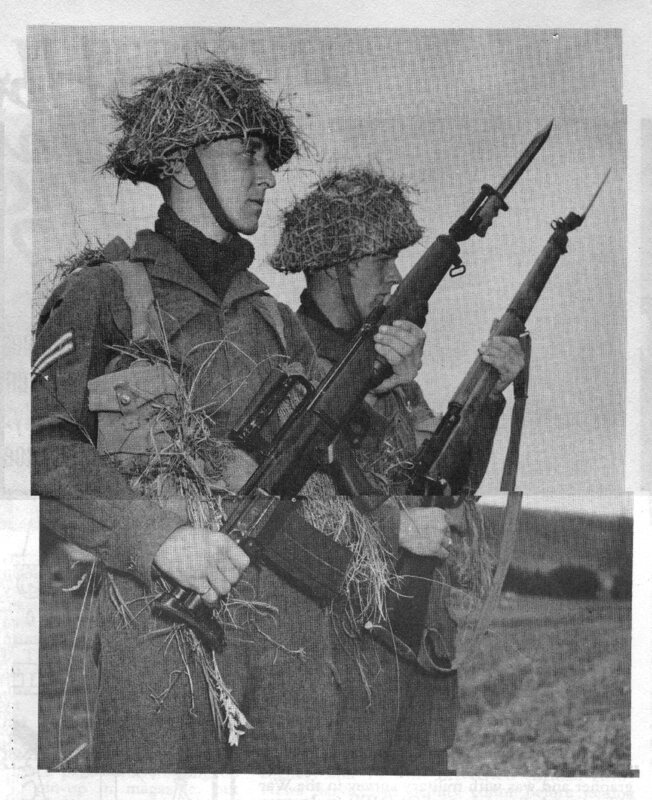 A press photo dated 10 June 1942 displays the 'old' and 'new' bayonet. 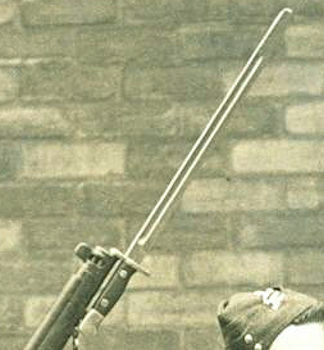 The caption reads "The Army's new "Stilleto" bayonet and its predecessor, referring to the SMLE rifle and P1907 bayonet, and the recently introduced No. 4 rifle with its No. 4 (Mk. I) bayonet. Note the scabbard of the No. 4 inserted on a P38 frog and leather retaining tab. 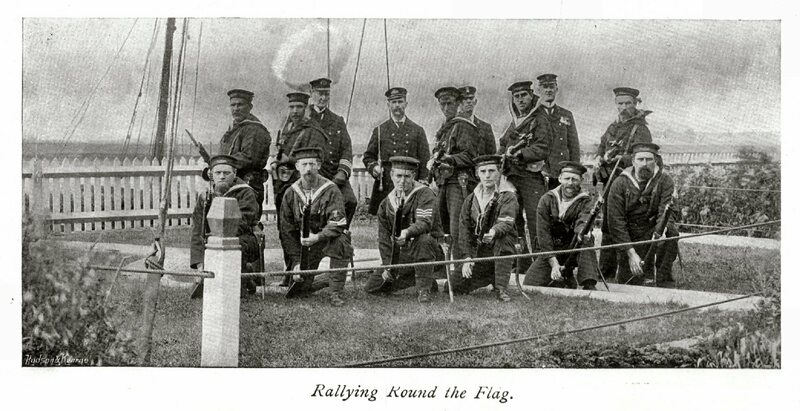 The Royal Navy was called upon in many of the turn-of-century conflicts through the Empire, often in support of landings and engagements supplementing regular troop actions. Although not as well armed as their Army comrades, and often equipped with out of date weaponery, they were nevertheless a formidable force to be reckoned with. As these two contemporary images show, bayonet training was taken seriously, and practiced regularly. This first image is interesting from a couple of perspectives. The background, with moored warships clearly illustrates the transition period from sail to steam. Life in the Navy was an arduously manual one, and the Bluejackets formed up to take a cavalry charge would have been a tough line to have broken. Training for this tactic was to be abandoned within a few short years as the Great War forced many changes. 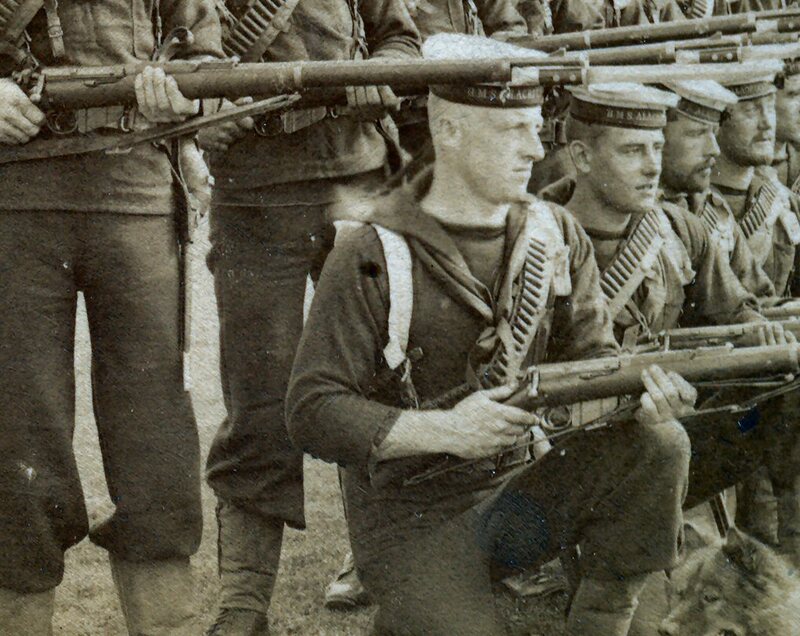 This second image shows sailors armed with P1888 bayonet mounted Metford rifles going through a move prescribed in the prevailing manual. 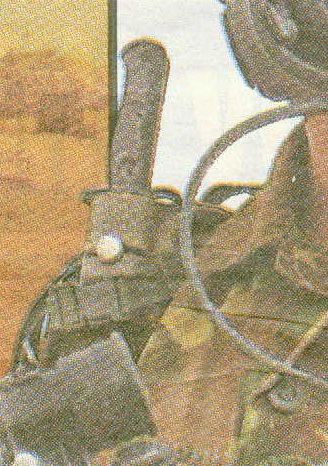 Although the weapons were identical to those issued to the Army, the belt frog was specific Pattern made for and issued only to the Royal Navy. 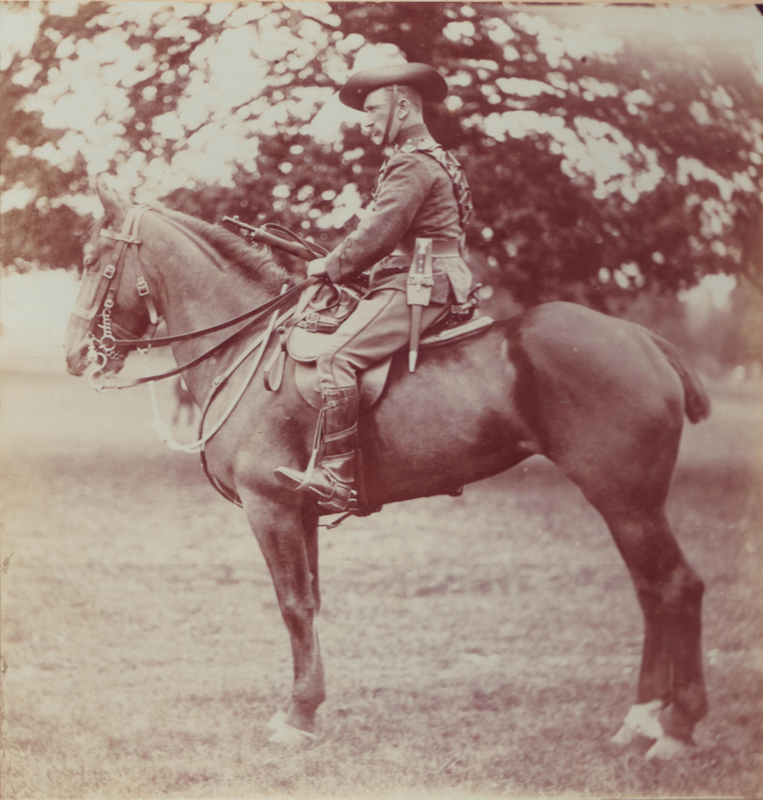 An undated cabinet card of an infantry private, probably around 1870. 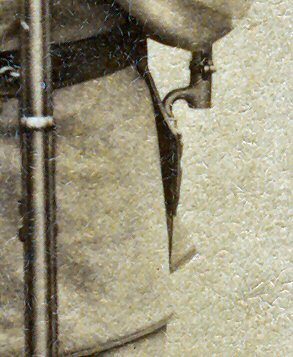 He holds a Snider Short Rifle, with a yataghan blade bayonet mounted, probably a Pattern 1860. 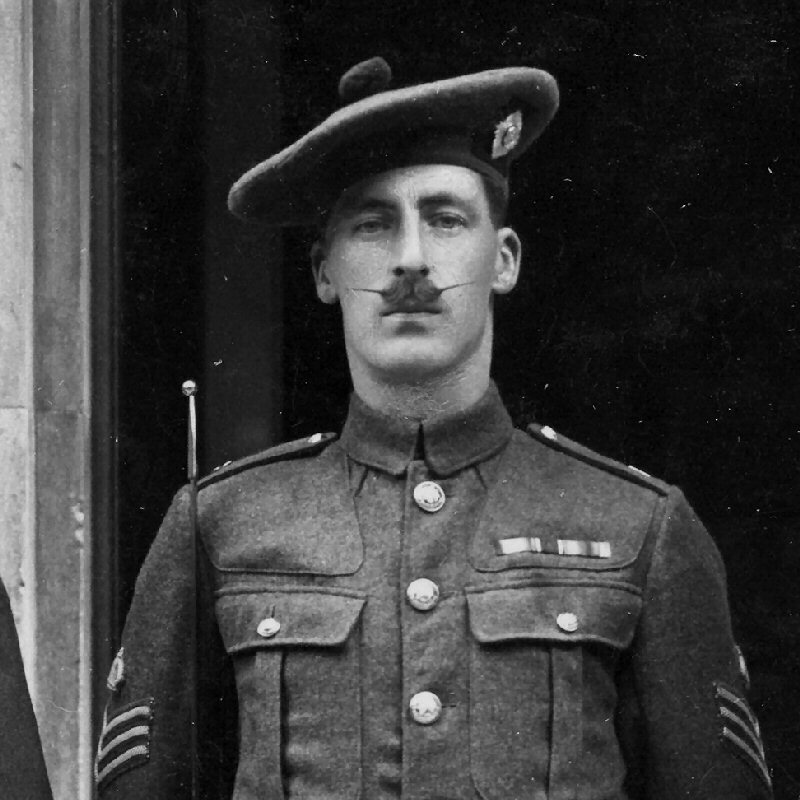 A Scots Guardsman at the Depot in Caterham. Fully kitted in P1908 Web Equipment, SMLE Mk.I and P1907 bayonet. 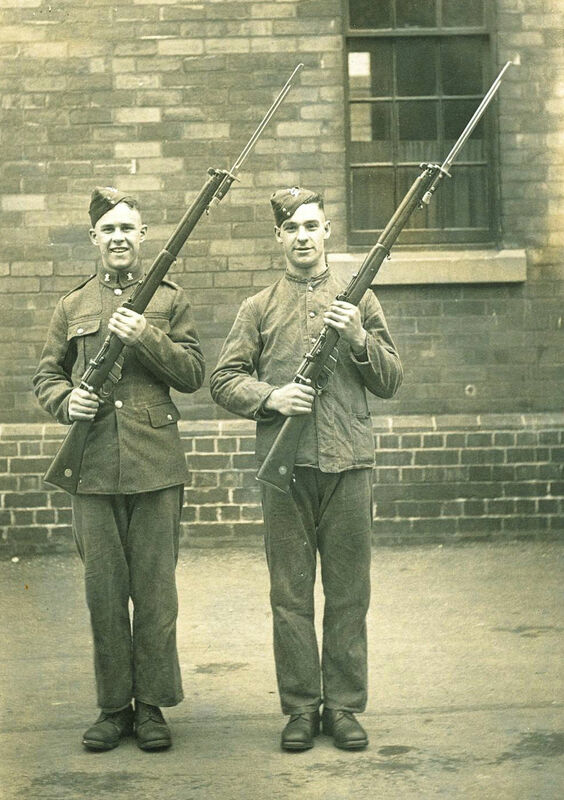 Two young recruits port arms with their SMLE rifles, bayonets fixed. 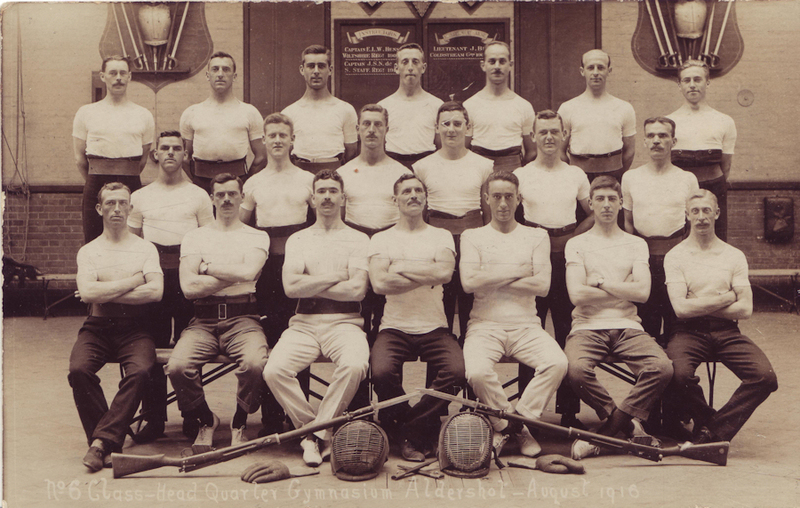 Probably in training for the Great War, the smiles soon to be gone from their faces. Thanks to fellow collector Alan Cowgill for sharing this image. 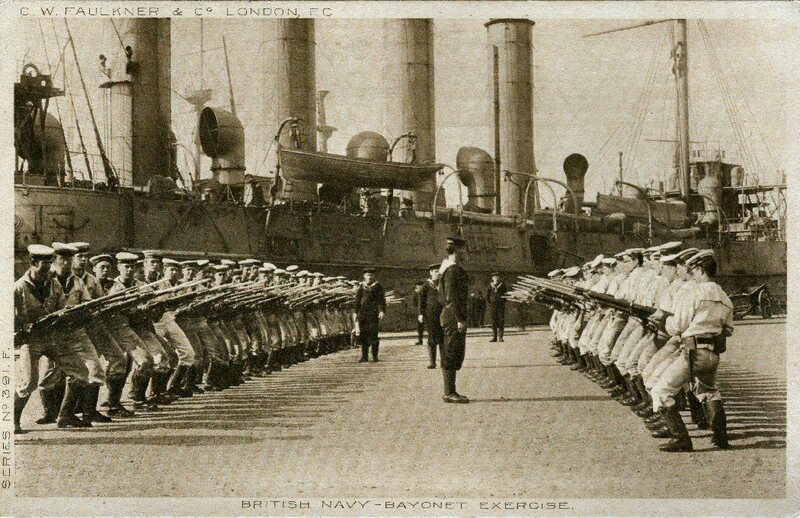 This must be post 1913, as neither bayonet has a hooked quillion, and the bayonet on the right has a clearing hole drilled through the pommel. Orders were issued in 1913 for unit armourers to remove hook quillons and drill pommel holes. This did not always take immediate effect, some pommels remaining untouched. 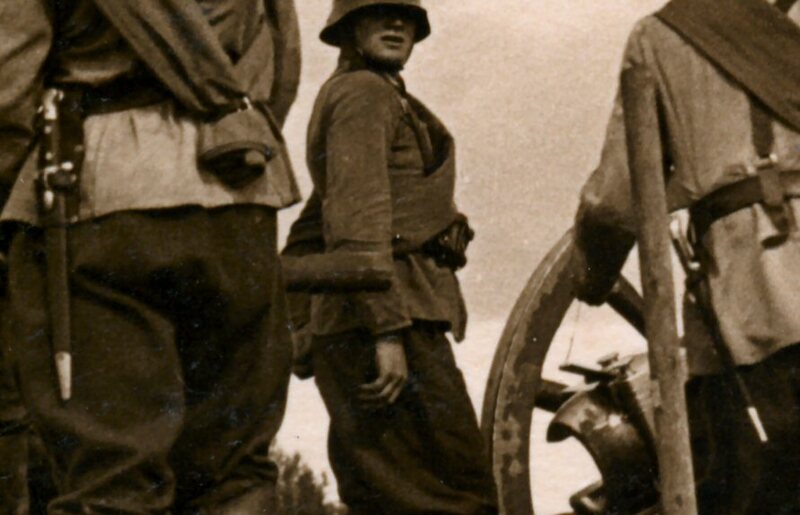 Note the blunted tips of the bayonets. In December 1914 approval was given for P1907 to be modified for practice by rounding the point of the blade. 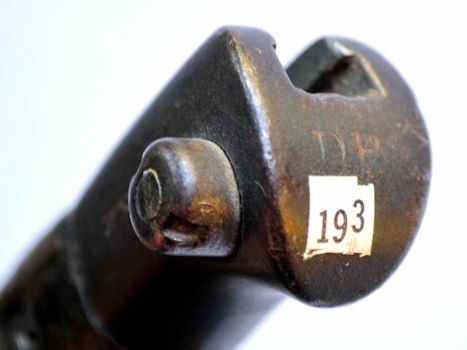 To ensure blunted Drill Purpose bayonets in scabbards were not issued for active service, DP was stamped into the end of the pommel for easy identification.